MarketGoo gauges your website’s popularity and gives you steps to climb higher in search rankings, such as how to boost the number of backlinks you have from other websites. Back up a second..what is a backlink in search engine optimization? A backlink is a link from a Website, back to your own Website. Sometimes they’re called Inbound Links. The quantity and quality of backlinks that your site has are important for search engines like Google to determine the popularity and importance of your website. How your website becomes popular is similar to the concept of being ‘popular’ socially. Think of the way a person looks for ‘social proof’ to guide their actions in ambiguous situations, you may know it as “following the crowd”, and experience it yourself when you ask your friends (whom you consider credible) for recommendations on a product or look through reviews before purchasing. In a similar way, your site gets ‘social proof’ when it has high quality (credible) links pointing to it (recommending it), and in turn it also has links towards high quality sites. This is one way search engines can evaluate your popularity; the more other ‘popular’ sites refer to it, the more credible your site must be! MarketGoo will help you to earn trust and authority with search engines, and guide you through the process of obtaining external links to point to your site. It’s important to avoid spammy tactics and making arrangements to exchange links with disreputable sites. In this area, we will work together to steadily increase the popularity of your site and ensure you get found by your potential visitors. 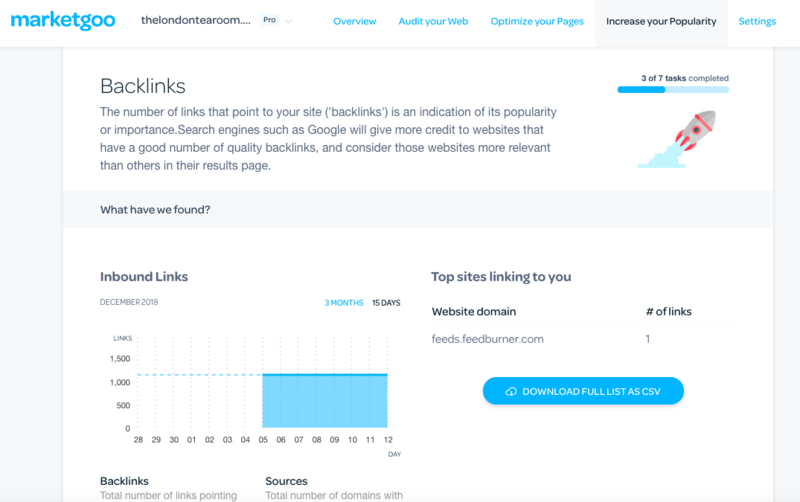 You will always be able to see a snapshot of the total number of links pointing to your site, as well as a historical view of your number of backlinks. To see examples of backlinks, check our guide on what exactly are links in SEO?